Still use Excel to draw scatter charts which are lack of uniqueness and not catchy enough? Actually, you have much more efficient and effective choice. 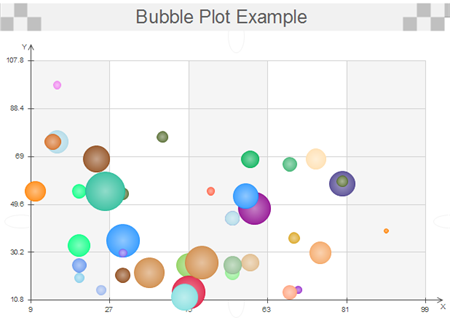 With Edraw, constructing a bubble plot chart takes only a few minutes. Refer to the guide below. Edraw offers you not only a template but also powerful tools and functionalities enabling direct edition right in the bubble chart. The strength of bubble chart lies in its ease of comprehension by displaying values with different size of bubble-like circles. One chart can show a set of three dimensions of figures. Aiming to help users as much as possible, Edraw has done many difficult operations in prior with only several simple steps left. Before starting, you need to prepare your own data so that you can choose a suitable template or bubble plot symbol. Analyze the statistics to decide maximum and minimum value and bubble number. Edraw offers one built-in bubble plot example and two templates. You can use anyone according to your need. If the example is suitable, just double click to open it and then modify it. If your statistics include negative numbers, use "Bubble 2" template in the Scatter and Bubble Library. Drag the suitable template directly onto a blank page. Enter the number needed in the dialogue box. If the data labels are hidden click "Show Data Label" in the chart's floating menu. Double click the text box of the labels to type in new names. Every bubble is attached with one floating button for editing its data, including X axis position, Y axis position and value. Change its data according to the instructions below. Double click on the bubble area outside the text box of label. The bubble's floating button shows on the upper right corner. Move the cursor towards the floating button and hit it. Enter your own data in the dialogue box. Select the bubble by double clicking it. 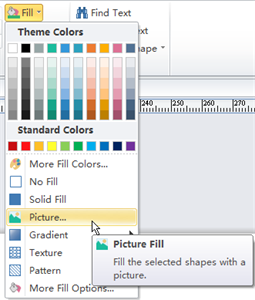 Under "Fill", choose the color and fill pattern you like. Choosing "Picture" will change the bubble background with the picture you select. The picture's size is automatically adjusted according to the bubble size. By using different colors and fill patterns, you can beautify your graph. Furthermore you can make it infographic and more impressive by attaching other visual clipart and pictures. After you complete the bubble plot, you can save it as a project file for revision later. Or you can print or export it in the html, pdf, svg and transparent png format. In addition, exporting it into MS Word, Excel or PowerPoint is also achievable with one click.